Mostly sunny. Slight chance of a rain shower. High 62F. Winds SE at 5 to 10 mph..
Cloudy with rain ending overnight. Low 46F. Winds N at 10 to 20 mph. Chance of rain 100%. 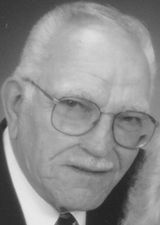 UNION GROVE – Benedict A. Galovits, age 90, passed away on February 9, 2019 at the Wisconsin Veterans Home – Boland Hall. He was born on April 21, 1928 to Benedict and Rose (nee. Kovacs) Galovits of Racine. Benedict graduated high school. He married Beverly Otwaska on November 4, 1950 and together they raised four children. Benedict was stationed in Germany during the Korean War (1950-1952). Benedict worked at JC Penney when he met Beverly. He went on to work at various car dealerships and retired from Walohan Lumber in Sturtevant. He enjoyed gardening, woodworking, fixing up the home and caring for the yard. Benedict is survived by his children, Victoria Lynn Schaut (Charles), Michael Alan (Linda Sue), Benedict Alex, Jr., and Christopher Scott (Michele); grandchildren, Abbie Schaut Honaker, Adam (Kristy) Schaut, Stephanie (Marty) Hoglund, Lindsay Galovits-Gotisha, Joseph and Nicholas Sobon; five great-grandchildren, Graham, Elise, Scarlette, Brooks, and Oliver; two brothers and seven sisters. He was preceded in death by his brother, Mike, his granddaughter, Jamie Lynn Schaut; and most recently, his wife Beverly in April of 2018. Visitation will be held at the funeral home on Wednesday, February 13, 2019 from 1-2:30 pm. Funeral services and military honors will follow. Private interment at the Southern Wisconsin Veterans Memorial Cemetery. The family would like to thank all those at the Veterans Home, Dr. Robert Brown, Dr. Sharon Hill, Aurora at Home Hospice, and the residents of Parkview Senior Living. All of the help you provided for our parents and the kind words and prayers helped us in times of need.